Who is Newt Scamander (Eddie Redmayne)? This is an important question we have to ask while watching Fantastic Beasts: The Crimes of Grindelwald, one we didn’t during the entirety of Harry Potter’s adventures at Hogwarts and beyond. Back then we knew who our hero was because of the mark on his head. Potter was the child of prophecy, the fated vanquisher of the wizarding world’s greatest foe Voldemort. So we invested in him and his friends from the beginning. We willingly grew with them year by year as they matured into their legacies right before our eyes. They became extensions of “good” and the salvation for wizards and Muggles alike. That connection sustained us through the tough times and emboldened us with their victories, big and small. So I ask again: who is Newt Scamander? He’s a genial fellow—a scholar with social anxieties as likable as he is eccentric. And he’s also a tool in Albus Dumbledore’s (Jude Law) pocket much like Potter. The difference is that Newt is a pacifist seeking peace and understanding between wizards and the magical creatures they fear from a lack of knowledge and the assumption that they’ll expose their kind to a volatile humanity stuck in a tenuous respite between World Wars. He’s a sidekick possessed by a pure-heartedness that combines with an underappreciated Auror (Katherine Waterston‘s Tina Goldstein), her flighty yet powerful sister Queenie (Alison Sudol), and the portly “no-maj” baker who’s endeared himself to them (Dan Fogler‘s Jacob Kowalski) to become “good’s” best chance at survival. It this way they symbolize heroes and perform heroics without being heroes. They’re supporting players in their own story and thus difficult to truly invest in like Harry, Hermoine, and Ron. It doesn’t help that J.K. Rowlinghas forced herself into a corner dictated by the impetus of this saga: the so-called “fantastic beasts.” What started as a reference book written to raise money for charity is now a footnote within this potential five-part epic prequel series we might not even want. These animals are why (or, as we soon learn here, the pretense for why) Newt was in New York City in the first place. And they were beautiful distractions filling runtime and providing excitement to surround a rather straightforward introductory chapter to this new sprawling world. They aren’t substantive equals to the trails and tribulations of adolescence, though. 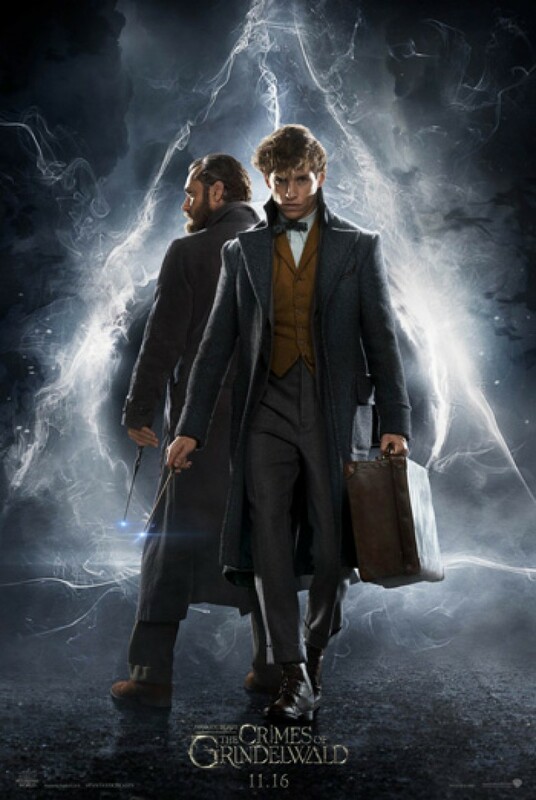 Their existence and seeming danger to safety until Newt can work his monster whispering techniques and calm them down isn’t enough to carry weight against the over-arching plot. Whereas Voldemort’s rise from the ashes was background dressing to perilous challenges that worked to entertain with suspense while also preparing Harry and friends to be who they were born to become, Gellert Grindelwald’s (Johnny Depp) call to arms for freedom as a ruling class above the power-hungry humans they could crush with the flick of a wrist is at the forefront. Until Rowling accepts this fact and ceases to try to make the “beasts” happen as anything more than window-dressing, we’re to be indifferent with the stakes. This is the push and pull that’s thus far kept us at arm’s length from Newt and company. Every time it appears we’re going to delve into the mythology of what Rowling has crafted, we’re diverted onto a path of CGI-heavy antics led by dragons, Nifflers, and whatever else is chomping at the bit to escape Newt’s suitcase. As his quartet of protagonists finds themselves running around like chickens, always one step behind the villains, Grindelwald reveals himself to conversely be in complete control. Not only that, but the object of his interest (Ezra Miller‘s orphan and obscurus Credence) is now the subject of a different prophecy. He’s the one who’s foretold to “save” those with magic inside them from genocide. His power will give Grindelwald’s acolytes purpose. Rowling has therefore flipped the script. Where Harry Potter’s survival was the “good side’s” mission and his death that of the “bad,” Credence finds himself positioned at the center of opposite circumstances. Grindelwald needs him alive and by his side to do what he cannot, the Ministry of Magic’s authoritarian President Picquery (Carmen Ejogo) needs him dead to ensure her enemy’s plans can’t come to fruition (whatever they are), and Newt hopes to reach the boy and do both: save his soul while destroying his evil. In this way Credence is the true star and yet he’s drawn as pawn. Suddenly the fact that Newt, Tina, Queenie, and Jacob are well-acted but two-dimensional stock characters makes sense five hours later because the spotlight is finally placed upon Credence’s head. And oh boy is there a lot to unpack upon this journey. Whereas Fantastic Beasts and Where to Find Them was a fun and breezy (by comparison) entryway into a vastly expanded environment outside Hogwarts’ walls, The Crimes of Grindelwald goes into overdrive with exposition. 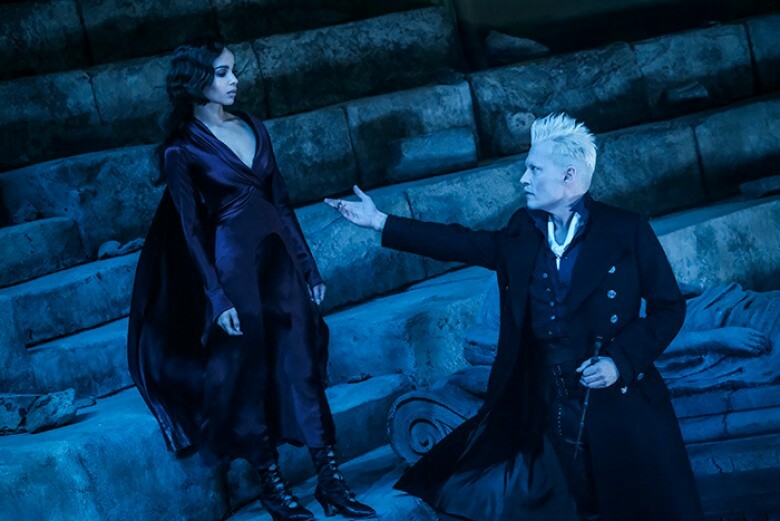 There’s the Lestrange family’s lineage (led by Zoë Kravitz‘s Leta, the one-time flame of Newt’s who is now engaged to his brother Theseus as played by Callum Turner, and the mystery surrounding her presumed dead younger brother Corvus), the politics of segregation and love (Jacob seeking freedom of the mind while Queenie seeks freedom of the body by risking indoctrination at the hands of Grindelwald’s rhetoric), and duality within Credence as signified by his friend Nagini’s (Claudia Kim) hope and his obscurus’ despair. Unfortunately so much leads to hollow sacrifices—empty because we’ve only just learned of certain relationships before seeing them tested and inevitably broken or proven. Instead of using six movies to cultivate lasting dynamics, power struggles, and complexity before swinging the axe a la The Half-Blood Prince‘s shocking betrayal and unforgettable consequences, Rowling does it all in two hours with a pay-off as cheaply manipulating as it is intriguing. The amount of sibling-based conflicts alluded to and born is laughable because only one or two truly matter. Where Rowling once played the long game with Potter, she seems to have lost her patience in the transition from novels to screenplays. And rather than build trust in her characters via tiny victories, she’s once more left them to fail. This to me is the main reason The Crimes of Grindelwald feels so deflating. While David Yates continues his capable direction and the special effects get wilder and wilder, it’s a debilitating experience to spend so much time with these characters only to watch them come up short. I’m half wondering if we’re supposed to be rooting for Grindelwald in all this, as though Rowling is setting Dumbledore up to be a mediator between two evils. If what I’m inferring is correct, she’s presenting America as a government entity attempting to keep wizards in chains. And honestly, if Ejogo’s performance in the first film and Derek Riddell‘s as head Auror in this one are any indication, they are the bad guys. They’re unwaveringly stubborn in their bureaucratic oppression. So maybe Rowling is playing the long game after all. Maybe she’s showing our assumed “good side” as misguided, flawed creatures too invested in a goal to see their tactics have been warped. She’s intentionally setting them up to be the over-zealous police force—the torturers against Grindelwald as martyr galvanizing misjudged “others” to claim their autonomy. We can therefore hope future installments will gradually shift things back, turning the tables so Dumbledore can show the Ministry they’ve gone too far just as Grindelwald shakes opportunistic pretenses to become the monster he is. Until then, however, this trajectory of good as bad and bad as good feels like a miscalculation. In four years and two films we’ve learned one thing: Newt and friends cannot win on their own. I’m still with it, though—for now. I was genuinely enchanted throughout by the familiarity of this cinematic universe even if the world has grown too big for its own good (the constraints of Hogwarts as a singular locale were a benefit to the previous franchise’s storytelling). And Fogler and Sudol’s plot thread was devastating enough (if unsurprising) to earn its emotional heft. So I’m going to believe Rowling is taking this route of undermining her protagonists with purpose, but she better prove it to me in the next one. Otherwise I may give up and simply assume she’s lost the plot on a quest to earn money off eye-candy and her own acolytes’ inability to recognize that the once potent magic is all but gone.